Be the first to share your favorite memory, photo or story of Marnie. This memorial page is dedicated for family, friends and future generations to celebrate the life of their loved one. 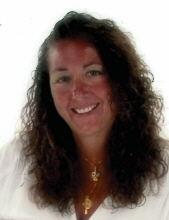 Marnie D. Adamski, age 48, U.S. Air Force Veteran, passed away suddenly on November 25th. Marnie was the beloved daughter of Geraldine, nee Stramaglio, Adamski and Warren Adamski; cherished granddaughter of the late Ralph and Josephine Stramaglio and the late Walter and Helen Adamski. Visitation will be Friday November 30th from 3:00 p.m. until 9:00 p.m., with funeral service 7:00 p.m., at Cumberland Chapels 8300 W. Lawrence Ave., Norridge, IL Interment will be private. Please omit flowers. Info 708-456-8300. To send flowers or a remembrance gift to the family of Marnie D. Adamski, please visit our Tribute Store. "Email Address" would like to share the life celebration of Marnie D. Adamski. Click on the "link" to go to share a favorite memory or leave a condolence message for the family.